Information about responsive design can be found here. Provide the Grid element with a title here. If this setting is active, all columns will be displayed with the same height. The height is determined by the highest column in the grid. 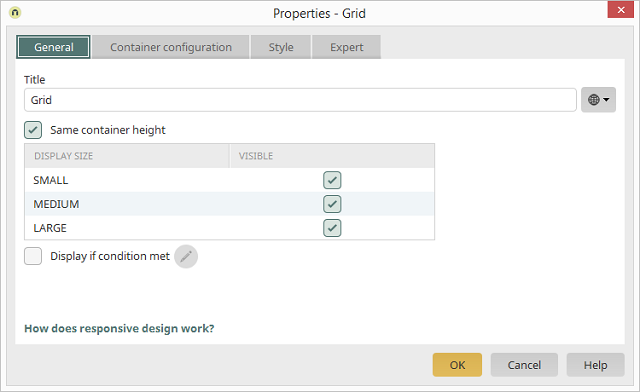 In the Design module, the minimum display width for the sizes "MEDIUM" and "LARGE" can be specified in the Layout properties, which can be opened via the menu Layout / Layout Settings / Responsive. With this setting, the entire grid can, if required, be hidden for each of the display sizes. Please note that hidden grids are still present on each device. This means that the volume of data is not reduced. Activates the Conditional display of the grid. This button opens the Script Editor where the condition can be formulated. Click on this link, which is found at the bottom of the dialog, to reach general information about this topic.